Welcome to a fun fall Monday. Did everyone have a good weekend? Of course it is fall now and well winter in some places and still nice in sunny in others. Where I am at they started putting up the pumpkin patches. I cannot wait to get some. I think we will be doing a pumpkin a week in my house. I just love the smell and carving them is so fun! The papers are from the new Bo Bunny Apple Cider line. I love these papers. I also used some jute string. I used a small large scallop rectangle for my copic colored image. I am so excited with the upcoming holidays. I guess they are always more fun when you have kids because you want to bake and decorate and get into the spirit. So I hope this inspires you to get into the fall mood! Those pumpkins are so sweet! Amazing job coloring them up Shanna! 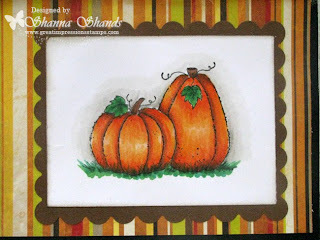 Those pumpkins are just right for that Bo Bunny paper line! 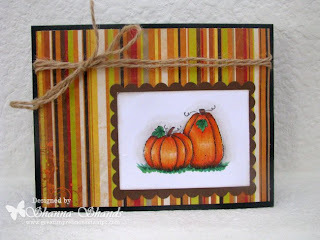 Fun card, Shanna! You're coloring almost makes them appear 3-D. Awesome job!